The great skua, the thug of the sea. 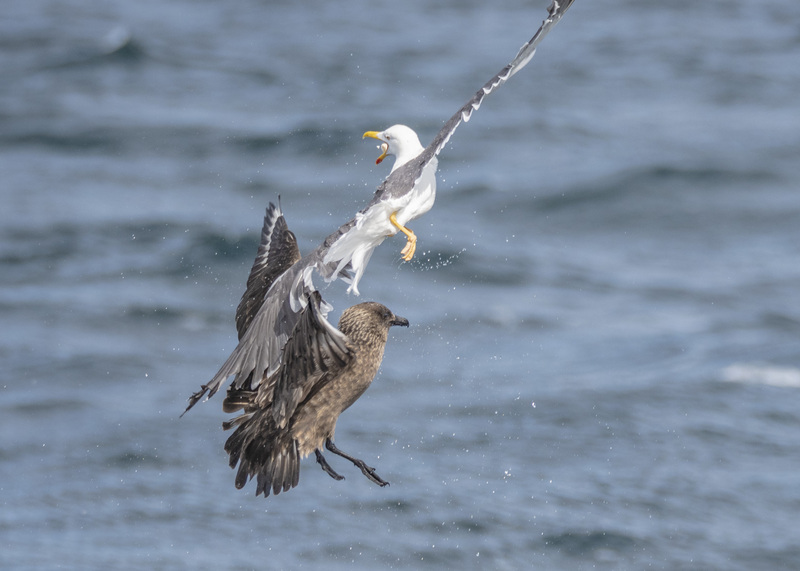 Also known as a Bonxie in the UK, the great skua will go to aggressive lengths to get it's breakfast. They're almost pirate like in their behavior harassing gannets and gulls and showing no mercy to puffins. Even humans daren't get too close for fear of being dive-bombed. But with all that in mind they are fascinating birds, even down to their origin. Though it doesn't look it, many ornothologists now believe that the Bonxie is a hybrid between it's cousin the pomarine skua and a species from the southern hemisphere. Let's see the big bully in action and great skua, this is a good one! Mugging this lesser black-backed gull, this great skua is after some food and the behavior has been captured so perfectly by James Officer. Thank you for sending it in James. If you'd like to see your photo as photo of the week, send us your pictures to natureshome@rspb.org.uk.